In this paper, the authors address the challenges of detecting and analyzing faces which are partially obscured by reflections on glass. So-called “non-transmitted reflections” can disrupt traditional face recognition models by distorting or occluding critical segments of the face. This research attempts to solve this problem with a four-stage model. First, a Siamese Estimation Network is used to produce approximations of facial features given two similar image frames. To improve the reconstructed face’s perceived realism, these approximations are adjusted using a Face Alignment Network, followed by a face parsing network and a local refinement network. In practice, the authors found that they were able to use this model architecture to generate realistic-appearing faces from even severely-occluded images. “Face images captured through the glass are usually contaminated by reflections. The non-transmitted reflections make the reflection removal more challenging than for general scenes because important facial features are completely occluded. 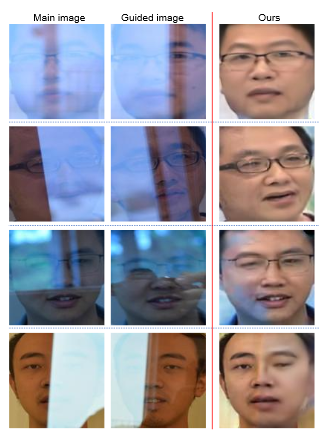 In this paper, we propose and solve the face image reflection removal problem. We remove non-transmitted reflections by incorporating in painting ideas into a guided reflection removal framework and recover facial features by considering various face-specific priors. We use a newly collected face reflection image dataset to train our model and compare with state-of-the-art methods. The proposed method shows advantages in estimating reflection-free face images for improving face recognition”. Jonathan Kleinfeld, Data and Software Engineering Intern at Brighter AI. Brighter AI is a Berlin-based startup founded in 2017. At Brighter AI, we are working to overcome limitations in human and computer vision with deep learning.